Having the opening move is an advantage as you have the opportunity to dictate the strategy of the game instead of merely reacting to your opponent. Start the game with two basic objects in mind. To try and trap your opponent's runners behind a blockade. To escape with your two runners before he can trap you. 6:1 - White moves 13-7, 8-7 to make this bar point. 3:1 - White moves 8-5, 6-5 to make his 5 point. 4:2 - White moves 8-4, 6-4 to make his 4 point. In each of these cases White is starting a process of building a blockade and hopes to add to it on his future turns until he can trap one or two of the black runners behind a 6-point prime. 5:3 - White moves 8-3, 6-3 to gain control of his 3 point. 6:4 - White moves 8-2, 6-2 to gain control of his 2 point. These two moves are rarely played by any experienced player. Their only attraction is that they are safe point-making throws. The two men situated on either the 2 or 3 point are too far away from the main blockade which you must build round your 6 and 8 points, and Black can jump them both only too easily when he wants to escape with his runners. By positioning two men on the 2 or 3 point they are no real threat to Black, and in effect two men that are needed to build a blockade further back are wasted in a position where they make little contribution to the game in its early stages. This group, unlike the safe point-making throws, involves you in taking a risk by leaving a blot on your 5 point, and hoping that Black will not hit it, thus giving you a chance to cover it on your next turn, to gain control of your vital 5 point. 5:3 or 6:2 - Move a man 13-5. 2:1, 4:1, or 5:1 - In each case you move the one by dropping a blot onto the 5 point, and bring down a builder onto your outer board, to increase the chances of covering it at the next turn. Diagram shows the 2:1 move; try out the other two yourself. 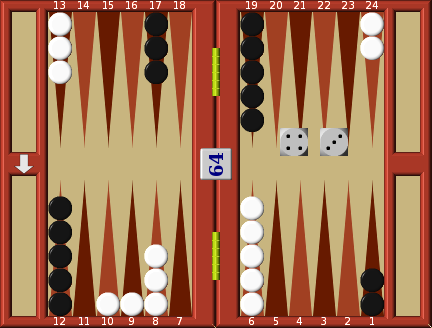 Leaving a blot on your 5 point may look very exposed, but in actual fact, of the 36 permutations of the dice, only 15 of them will enable Black to hit your blot on the 5 point. However, 6 of those 15 permutations are his own vital point-making throws, such as 1:1, 2:2, 3:1, 4:2, etc. He will therefore be faced with the agonising choice, break up your budding blockade, or make his own? 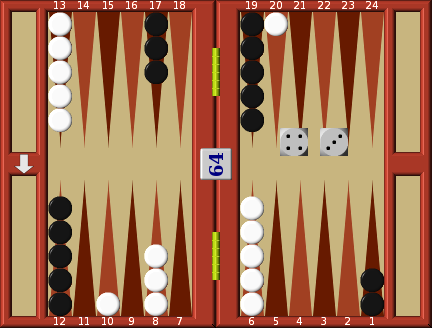 At this stage of the game when Black has 5 points open in his home board, being hit, though annoying, is not dangerous. You will quickly be able to re-enter his board. 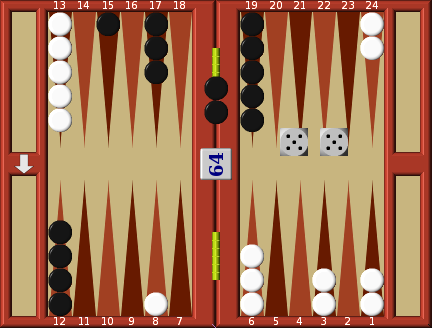 It is very important to take your risks at the beginning of the game whilst Black's home board is open, but do not take risks later in the game when his board is almost closed, and re-entry can cause great difficulty. This group of opening moves requires you to bring down two builders from 13 and leave two blots on your outer board, with the intention of enhancing your chances of making 9, 7, 5 or 4 on your next turn. At such a distance Black can only hit you with a very above-average throw, so with his board wide open the risk is well worth while. You would make such a move if your opening throw was 5:2, 5:3, 4:3, 3:2. If run and escape is to be your policy, rather than to try and trap Black, you would run with the following moves: 6:5, 6:4, 6:3, 6:2, 5:4 and 5:3. All are good running moves enabling you to get a runner well out onto Black's outer board. In diagram with a throw of 6:2 White runs 24-16. Try out the other outer board running combinations on your own board. Black will frequently miss the blot and many moves which enable him to hit it entail wasting a vital point-making move. So by running to the outer board you do have a reasonable chance of escaping. The smaller throws such as 3:2, 4:3, 2:1, can also be used as running throws. In diagram the 4:3 move is played 24-20, 24-21. This is an annoying move for Black. Firstly, you are threatening to escape with your two runners. Secondly, he will hesitate to leave a blot anywhere on his outer board, or on his 5 point, as the chances of a hit are now greatly enhanced. Thirdly, you are threatening to capture one of his vital points, such as the 5 point or the bar point, on your next turn. Much the same applies to the other inner board running moves. Try them out playing 3:2 24-21, 24-22 and 2:1 24-22, 24-23. This type of opening move requires one runner to start a running move in the opponent's home board, and the dropping of a blot onto the player's outer board, to enhance the chances of making one of the blocking points on the next turn. In diagram you see how White uses 4:3 by playing 24-20, 13-10. An opening move of this sort makes it difficult for Black to play his normal tactics. Firstly, by placing a man on 20 you are threatening to cover it from 24 on your next turn, and to gain control of a point vital to Black. Secondly, the man on 20 makes it difficult for Black to drop a blot onto his outer board. 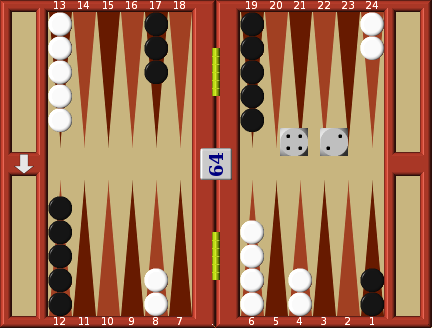 Thirdly, your blot on 10 equally makes it dangerous for Black to move a blot to 4, 5, 7 and 9. 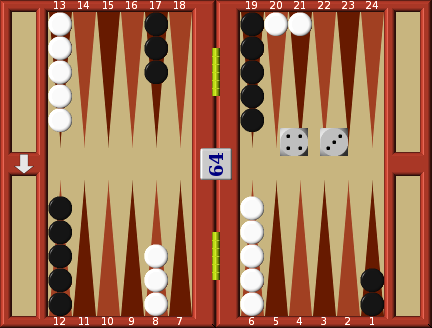 This mixed run/block type of opener can be done with many dice combinations, 5:4, 3:2, 2:1, etc. 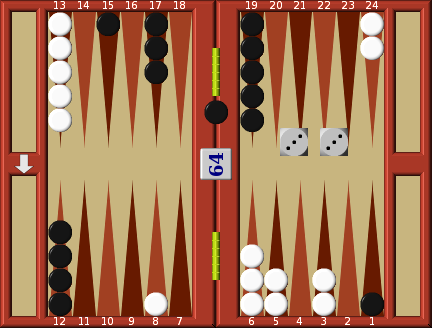 They all reduce the options open to Black when he responds to the opening move. As the responder you do not have as much freedom of action as the opener. By his choice of opening move he reduces the choices open to you. However, the one compensation is that you could throw a double, and all doubles are nice safe point-making throws. Therefore we start by examining all the doubles that might come your way and how to play them. 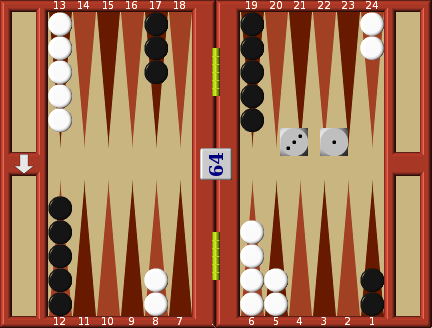 In diagram Black has opened 3:2 and played 12-15, 1-3. You get 6:6. You move two men 24-18 and the other two men 13-7, a perfect response with your runners well on the way to escaping and at the same time you have blocked off the 7 point to create a 3-point blockade in front of Black's escape route. Some players always double when they throw a double 6 for the response. If this is ever done to you, accept. It may be a flying start, but there are difficulties ahead for the double 6 player; his men are now clustered together in a way that makes it difficult for him not to expose a blot with future moves. In diagram you get 5:5. Of all the doubles, this is the worst one to get at the beginning of a game. There is normally only one way to play this move: you play two men 13-8, and the same two men 8-3 to make the 3 point. However, in this instance Black has split his back men on the opening move and turned what is normally a poor throw into a crushing blow. Your correct play is to move two men from 8 to hit Black's blot on 3 and two men 6-1 to hit his second blot on 1. 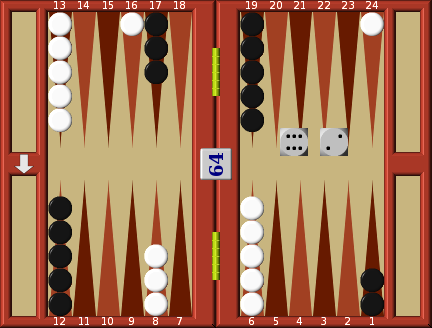 Two of Black's men off the board in one throw, and you have closed three of the re-entry points at the same time. 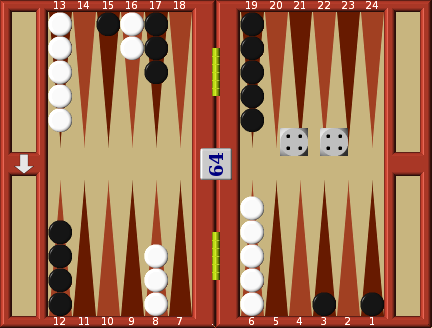 If Black fails to get his two men re-entered on his next throw you should instantly double him, and if he is wise he will refuse your double and pay up, as his position is very adverse. If your throw is double 4, you have many choices open to you. If your policy is to run, then move your two runners 24-20 and on again 20-16. If your choice is to block Black's runners then you would move 13-9 and the same men on again 9-5 to make your 5 point.If you wish to play a mixed run/block game then play two men 24-20, and two men 13-9. Try all these moves on your own board. If your throw is double 3, you have another perfect throw. If run is your policy you would move your two runners to the black bar point, 18. This however would be a waste for a double 3 which is one of the best blockading doubles. 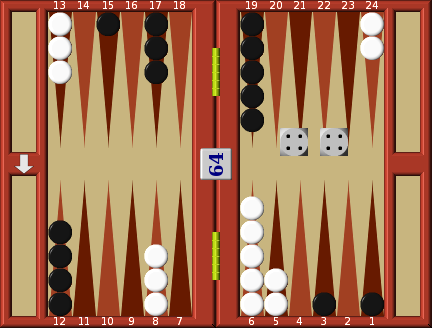 If Black has not split his back men you would play two men 13-10, and two men 8-5, as in diagram. However, when Black has split his runners, your blot on 8 would be too vulnerable to risk this move. Far better in these circumstances to play 6-3 to hit his blot, and 8-5 both to make your vital 5 point and to reduce his chances of re-entry. A sharp reverse for Black, but not quite good enough for you to double him. At this stage of the game you would only double him if you have knocked two of his men off the board. If your throw is double 2, you again have a throw that is too valuable to waste on running with your runners. You could use it to make your 9 point moving two men 13-9, but it is probably best to move as in diagram to make your 4 point, two men 6-4, and two men to your 11 point, 13-11. If your throw is double 1, there are only two moves worth considering. If Black has not split his back men you play two men 8-7, and two men 6-5 to gain control of the three most important points. 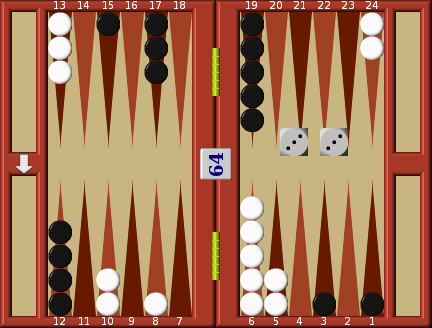 If, however, Black has split his back runners, your blot on 8 is too vulnerable to a return shot from Black, so you play the double 1 by moving 8-5 with one man, and the remaining one is played 6-5 to cover the 5 point. 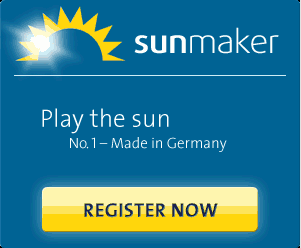 If your opponent's move does not make it adverse, play your moves as though you were the opener. With rare exceptions, play all important point-making throws to make the important points, in order to trap your opponent's runners, i.e. 1:1, 2:2, 3:3, 4:4, 6:6, 3:1, 4:2 and 6:1. If your opponent has split his runners but still has both of them in your inner board the risk of dropping a blot onto 5 or 7 to try and make a vital point is too great: it will almost certainly be hit. If your opponent is threatening either to escape or gain control of your vital 4, 5 and 7 points by placing a blot on them, give serious consideration to hitting him and driving him back. Do not bother to hit his blots on your 1, 2 or 3 points; there will normally be better ways of playing your move at this stage of the game. If he has moved into his inner or outer board, threatening to try and block in your runners, hit him and break up the blockade before it can form, but not at the expense of making your 5 or 7 point. If there is nothing constructive to do with your throw and you can hit two of your opponent's men in one move, do so, even if it means that you might have to leave a blot in your home board. If you are forced to leave a blot in a vulnerable situation, select a position where, if it is not hit, it will enable you to gain a vital point if you can cover it on your next turn.